An Axure RP library to create compelling UX documentation in no time. Add annotations, map user journeys and define interactions in great detail. So crystal clear that even a monkey will be able to get it. Quickly add annotations that can be toggled on and off anywhere in the prototype. Connect your wireframes and project management tools to a navigable map of the user journeys. Works on both Mac and Windows, requires Axure installed on your machine. Risk free: not happy with your purchase? Get in touch within 14 days for a full refund. VAT may apply (EU countries only). Organise all functional specifications, rationales, and design-related information in one central document, always up to date. External documentation is frustrating. 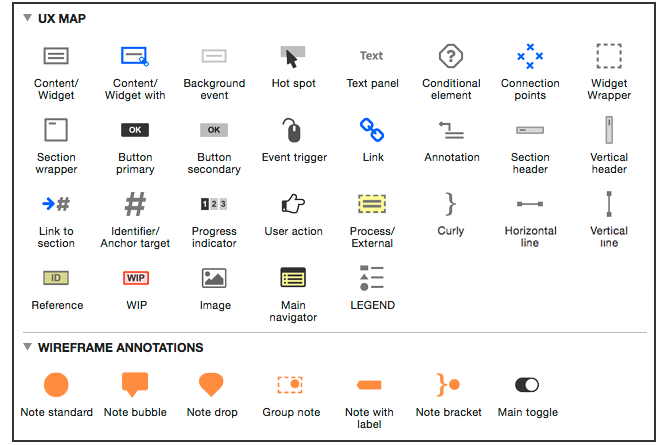 UX map annotations are contextual and can be accessed with a simple mouseover. Keep pace with evolving agile projects. Document complex interactions by adding self-explanatory, lightweight annotations that are easy to maintain. Gaps in the design documentation are filled with assumptions. Make sure that developers and other stakeholders know how you intend the product to work,. The UX Map visual language is easy and intuitive: no need to go through a convoluted documentation, or learn a new syntax. In today's UIs, interactions trigger subtle content changes, in-page transitions and background events. Map them at the level of detail that you want. UX Map takes full advantage of advanced Axure RP interactions to deliver a pleasing and engaging user experience to those who will access your documentation. The vectorial elements in the UX Map library include custom styles that allow you to change their appearance with just a few clicks. UX map is the result of many years of daily experience using Axure RP at full speed. Get all the advantages of prototyping like a pro, without starting from scratch. New event trigger widgets including gestures are available in UX Map v3. Learn quickly how UX Map works through the tutorials. You'll see how much value you can add with little effort. What's the meaning of the UX Map visual language? How do I learn it? 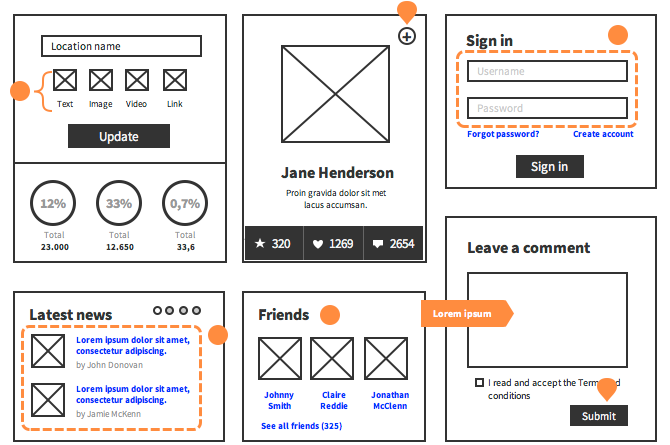 The UX Map visual language is does not have a rigid syntax and you can use the way that best fits your project goals. That said, the quick reference page gives you some examples on how to content and interactions are supposed to be represented. Who is UX map for? UX Map is intended primarily for designers, but can also be an ideal tool for product managers, or anybody who is familiar with Axure RP and needs a tool to document users interactions in detail. In order to use UX Map, you only need to have Axure RP installed on your machine. Is it difficult to learn? How well should I know Axure RP in order to use this tool? If you follow the instructions, using UX Map is really simple, and only requires some basic knowledge of Axure RP. In order to make full use of all its capabilities, you need to be familiar with masters and raised events. If you are looking for training resources, you can start with the official Axure online training, then get to the next level with the advanced online training tutorials (also created by the same author of UX Map). This is arguably the most advanced online training available today, approved by Axure and featured on axure.com. Those who purchased a UX Map license can request a $20/$40 discount (individual/corporate license) by writing at info@humaneinterface.net. Does it work with Axure Standard licenses? UX Map works with both Axure Standard and Axure Pro licenses. Does it work with Axure 9? UX Map works with both Axure 8 and Axure 9. I am a PROJECT MANAGER, what benefits can I get from UX Map? UX Map was created as an alternative to functional specification documents that are disjointed from design. By keeping all the documentation in context and depicting user journeys using a simple visual language, it makes it easier and faster for developers to find unambiguous, precise and up-to-date product specifications. If you are using project management tools to track progress, you can add references on UX Map that link to external URLs (such as JIRA pages, for example). Use UX Map as a central repository of design documentation. I am a VISUAL DESIGNER/ART DIRECTOR and my design documentation is mainly made of images, can I use UX Map to my advantage? Yes. You can import all your images into Axure and then add annotations to document how the interaction should work. 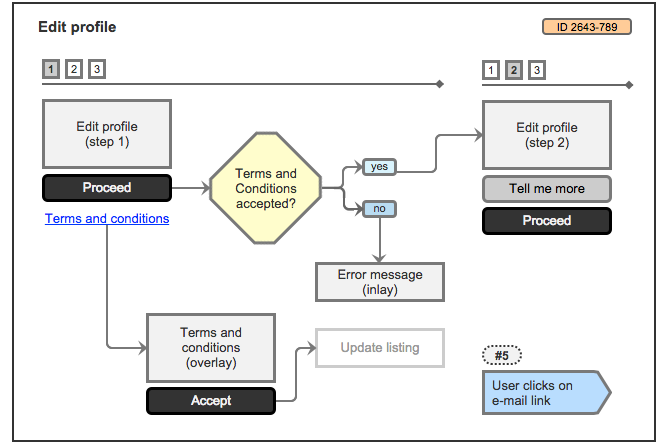 Any information that is not included in the mockups can be expressed in the form of flow diagrams. 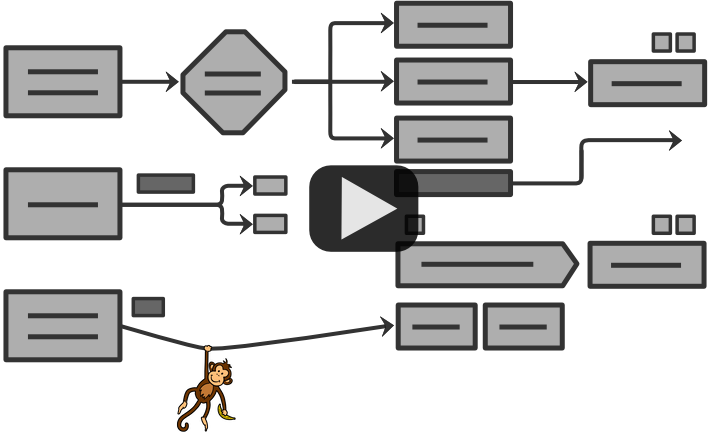 This looks like some sort of modelling language, like UML. Is that the case? Not really, there are some analogies as it's meant to be a way for designers to document their ideas so developers can easily understand them. However UX Map is more oriented towards human-computer interaction and is not intended to reflect the software architecture in any way. It's meant to represent in detail how the interface responds to user actions, and define what happens in the system, from a user's perspective. The UX Map visual vocabulary is also a lot looser compared to the one used in traditional modelling diagrams, such as UML or similar. It's meant to be simple and self-explanatory, and you can really use it the way that works best for you. Can multiple people work on the same project? Yes. For that you need an Axure RP Pro license, that includes Team Projects. How about mobile user experiences? UX Map is device-agnostic, it can be used to describe the user interaction on any sort of product and device. Can I use UX Map on mobile devices? UX Map annotations can be adapted to be viewed on mobile devices. That said, both the the diagramming component and annotations are best suited to a large monitor. Desktop is in general the recommended option for design documentation delivered via Axure. Can I change the appearance of the UX Map elements in my documents? Absolutely. As all the elements in the library have custom styles applied to them, you can make changes to both the main widget library, or the specific project that you are working on. There is no trial as it's a one-time-download product, but you can get a full refund within two weeks of purchase, if you don't get what you expected. Is there a discount for students and teachers? Yes, UX Map is student friendly! You can get a FREE license by writing to info@ux-map.com using your email address from an educational domain, or you prefer to use your personal e-mail address, please attach a proof enrolment (such as student ID), with your name and the expiration date on it. Do you need Axure installed on your machine to view the UX Map components? No, once you've added UX Map components to your prototype, they are exported as HTML together with the rest of the prototype, so anyone can view them (for example, via AxShare, but also locally), without having Axure installed on their machine. Can I add UX Map to an existing Axure project/HTML prototype? You can easily add all UX Map components to an existing Axure RP file. If the integration is too complicated to carry out (for example, the project is already quite large), you can also create a separate UX Map and add manual links to the HTML pages generated on the other project (as long as the HTML pages of both projects are exported into the same folder). I am still using Axure 7, is it going to work? Once you purchase a license, you can request to receive version 1.1 (compatible with Axure 7), in addition to the latest release for Axure 8. Yes. All payments are processed through DPD, a PCI-compliant service provider specialised in digital downloads. DPD adheres to the PCI DSS requirements for security management, policies, procedures, network architecture, software design and other critical protective measures. The installation and inclusion of Font Awesome as web font is not necessary any more. The Main Switch widget (previously called Main Toggle) includes selected/unselected widget states instead of multiple panel states. 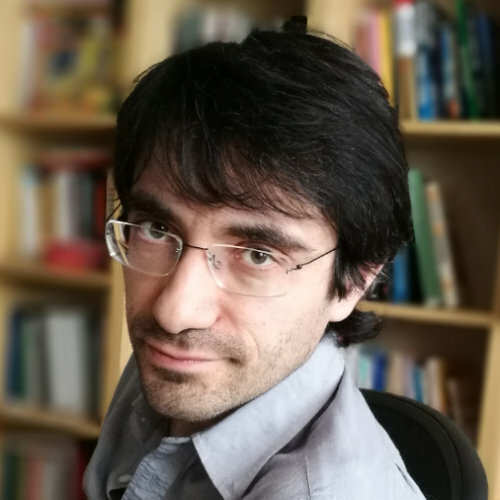 Luca Benazzi has been working since 2003 as a UX consultant for small startups as well as corporations such as eBay, PayPal, Expedia, Thomson Reuters, Sky, Philips, to name a few. He's been training companies in Europe and the US on advanced prototyping techniques with Axure. He's been testing out and reviewing every single piece of prototyping software available on the market (more than 100 products at the time of writing). Back in 2009, he created the most comprehensive showcase of Axure functionality available on the Internet, Axure in action. He's currently working on a brand new UX training program which is also going to include advanced Axure tutorials.